Who: Former Governor George Deukmejian, Presiding Judge Lee Smalley Edmon of the Superior Court of Los Angeles County, Ronald G. Overholt, Interim Administrative Director of the Courts, and other dignitaries will sign the first steel column to be erected in the Governor George Deukmejian Courthouse, now under construction in Long Beach. Note: Due to space limitations, the dedication is not open to the public but only to invited guests and the news media. What: The event will include remarks and a ceremonial signing of the steel column. The Clark Construction team will then set the column into place. Where: New courthouse site West Broadway at Magnolia Avenue, Long Beach (map). Parking is available at the 101 North Magnolia Parking Structure (there is no charge for parking with presentation of event invitation). Agenda: 10 a.m. opening remarks 10–11 a.m. signatures on first steel column 11 a.m. set steel column. Why: This project will improve public access and security and increase the efficiency of court operations by replacing the dilapidated Long Beach courthouse, one of the worst court buildings in the state. 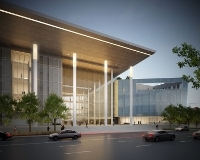 The project is the first courthouse in the United States to be delivered through Performance-Based Infrastructure (PBI), an innovative arrangement in which the state has engaged a private company, Long Beach Judicial Partners, to finance, design, build, operate, and maintain the building. Targeted for completion and occupancy in late 2013, the new building will house 31 courtrooms as well as offices for Los Angeles County justice partners. The parking structure across Broadway from the new building is also being renovated and expanded to more than 1,000 spaces. The state owns the land and the building throughout the 35-year PBI agreement, with annual service payments beginning when the court occupies the building. More information on the project: Local project website and the local construction site webcam.